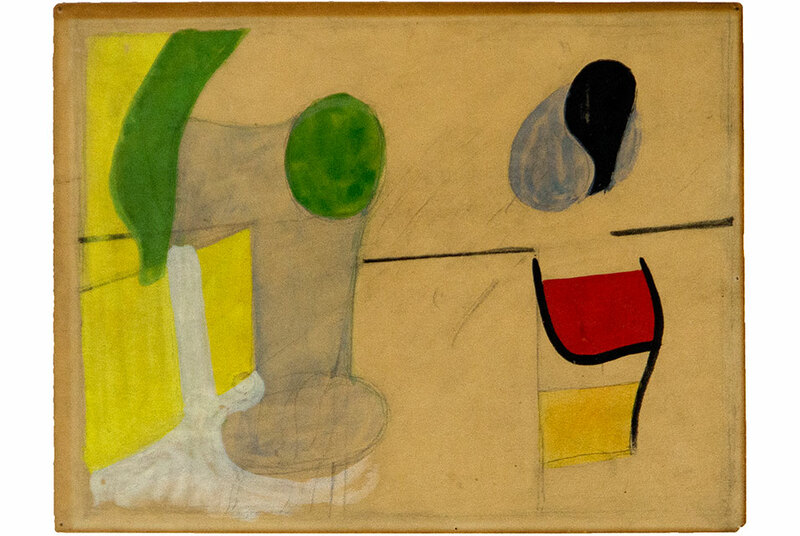 Willem de Kooning, Untitled. Gouache on paper, 5 x 6 3/4 in. NEW YORK, NY.- The first exhibition in many years of paintings and works on paper by Elaine and Willem de Kooning will be on view at Heather James Fine Art, New York, from November 8, 2018 - February 28, 2019. de Kooning x de Kooning traces the artists early experimentation with abstraction and figuration with paintings and photographs from the Rudy Burckhardt family collection, and includes later works from other private collections to illustrate how their styles evolved. Highlights include Willem de Kooning's Woman II Springs, c. 1961, part of a critical body of work that became known as his Women series. This signature painting will be joined by earlier gouaches from 1937-42 -- initiated right before meeting Elaine -- and a pair of small-scaled abstract paintings completed in 1958 -- soon after the couple separated. I kept jumping back and forth. Over the course of a year, Elaine sketched and re-sketched the president many times based on her original renderings, resulting in a highly gestural work that captures Kennedys restlessness. During the height of Abstract Expressionism in New York City, and largely overshadowed by her husband's growing fame, Elaine persevered to create a rich and diverse body of work. At a time when it was thought that a women's place was in the home, she challenged the status quo throughout her career as a ground-breaking artist, teacher, and writer. Among the group of Burckhardt's photographs of the de Koonings is one of Willem at work on Woman I, 1950. Now considered to be among his most famous paintings, Woman I, 1950-52, and Woman II, 1952, are part of the permanent collection of the Museum of Modern Art, NY. In order to provide greater context to the works on view, the accompanying exhibition catalogue features an interview by art critic Amei Wallach with artist Yvonne Jacquette, widow of Rudy Burckhardt. One compelling story revealed by Jacquette involves Willems gift of a postcard-sized gouache to Burckhardt, which was kept in his footlocker in lieu of a pin-up photo of Betty Grable throughout his service in WWII.